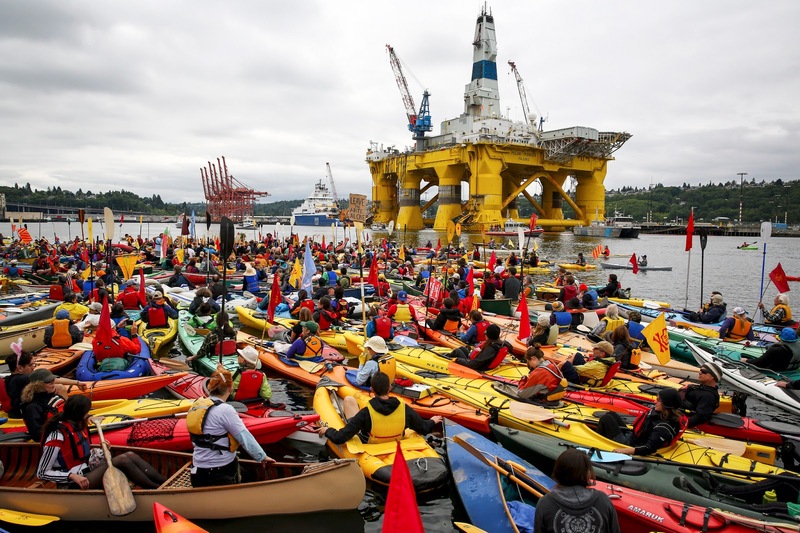 Environmentalists take to kayaks to protest Arctic drilling when Shell’s oil rig was housed in Seattle back in May. Photo credit: Daniella Beccaria / seattlepi.com via Flickr. Environmentalists are celebrating, after the oil giant Royal Dutch Shell has pulled out of its Alaskan Arctic drilling project. The company said they will abandon the project, after having failed to find enough crude oil. Environmentalists, lead by the environmental protest group Greenpeace, has claimed victory, saying that it was their campaign against Arctic drilling that eventually forced Shell to pull out of Alaska. The project in the waters of Chukchi Sea has proved a costly one for Shell, which has spent $7 billion on the project. In the wake of the falling oil price, they have faced growing pressure from shareholders to quit the project, as well as having faced pressure from environmentalists and green groups. Due to the low oil price the project was no longer economically viable. It could only break even with an oil price of at least $80 per barrel, a far cry from today’s price of around $45 per barrel. Shell’s Arctic drilling plans in Alaska go back to 2012. At the time, the company was forced to abandon the project when their drilling rig, the Kulluk, ran aground. This is just the latest of several costly oil projects that have been dropped, as the low oil price makes the economics of projects like this harder. These include BP’s decision to review investment plans for the deepwater Mad Dog 2 project in the Gulf of Mexico, and Husky Energy’s delay of an extension of its West White Rose field off Canada. While environmentalists are celebrating now, Shell and other oil majors still own several oil and gas drilling licences in the Arctic. If the market changes, another Arctic oil and gas fight could re-emerge, but for now it appears that the High North is safe from oil extraction. ← Opinion: The great fracking dilemma: do you want it on your doorstep?